ke Solutions - ke Solutions web design project news and press releases - Method to this madness: what people share on social networks and why? Dumb Ways to Die video (see above) was the answer proposed by the McCann Melbourne ad agency to Metro Trains operator from Melbourne, Australia. In a bold movement, Metro Trains gave the green light and so, at the end of 2012, the campaign video was made public and promptly went viral through sharing and social media. "For practitioners the potential benefits of viral video campaigns may seem abundant; however success can be 'hit and miss'. While some videos may be shared tens of thousands of times in a few short hours, others fall very short of expectations. So why do certain pieces of content get shared more than others?" - asked Dr. Karen Nelson-Field in a report published by The Ehrenberg-Bass Institute back in 2011. To answer this question, her team pored over videos and carefully assembled a large data set of user-generated content combined with 355 billion branded videos from social video marketing analytics platform, Unruly. Based on what she found in psychological literature, Nelson-Field started by placing emotions into four groups: high and low arousal positive, and high and low arousal negative, as you can see below. 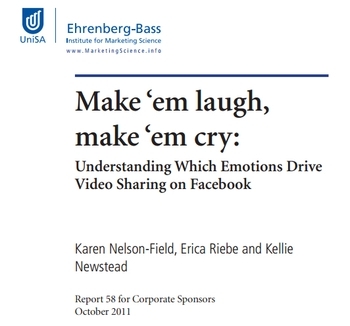 Nearly 80% of the video content surveyed did not include the degree of emotion necessary to drive sharing. High Arousal content is twice as likely to be shared than Low Arousal Content, irrespective of whether it is positive or negative. Positive High Arousal content ( such as astonishment or hilarity) elicits 40% more shares than Negative High Arousal (such as shock or anger). Videos eliciting exhilarating emotions (such as personal triumph) are at the top of the list of most shared content. Up to 65% of videos that elicited a feeling of exhilaration were remembered, followed by 51% recall rates for hilarity-based video content. Video length is important because emotional content needs time to have an impact; the optimal length is at about 2-3 minutes. In the end, the 'method to this madness' alluded in our title boils down to this: you can either spend a lot of effort generating content with a high degree of emotional Arousal (very difficult and rather time- and resource-consuming!) or generate easier, low-arousal and more varied content in larger amounts.